Edward Mansfield born 1825 in Crediton, Devon. Edward Mansfield was born in Crediton, Devon, England on the 24th January 1825 and was christened in Broad Street Independent Chapel on the 20th March 1825. He was the sixth child of William Mansfield of Culmstock and Susanna Pearce Andrews of Topsham. Both towns are only a few miles from Crediton. He married Mary Norman of Ashburton in March 1851. In the 1851 Census he was aged 26 and living at Battshills Farm, Week Village, North Tawton, Devonshire. There was a large woolen mill in North Tawton employing around 150 workers and was probably the reason Edward moved there. His older brother Willam was employed in the same mill. 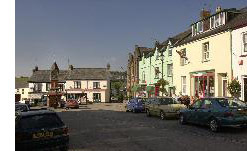 Opposite is a picture of the Square in North Tawton. The 1881 Census sees them living in Okehampton Street, North Tawton and he has changed profession from a wool comber to a grocer and has two daughters. Note that the older daughter is named Susanna the same as Edwards mother. Okehampton Street is now called Fore Street and runs from the Square down to the River Taw and the Mill. Above: Extract from the 1881 British Census. In the 1901 census an Edward Mansfield is described as Father in Law and living wth the Rice family at West Newton Farm, Zeal Monachorum, Devon which is around 4 miles North East of North Tawton. This would suggest that he was staying with his daughter Susan (Susanna) although her age should be 47 not 49. Another transcription error, although the age and birth place for Edward match.